I got the MUA nail constellation from Superdrug the other day for £2 and I just had to try it out before I get my false nails sometime in June/July. I am rubbish when it comes to doing things that take time and effort. I just don't have the hands for it as you can see from the pictures below. You can buy these online at www.muastore.co.uk or from superdrug. I personally found my nails just looked messy but maybe that is the look. I'll have to keep using it and see if I get better. First you paint your nail whatever colour you like, I picked a clear varnish for my nail and a pink French manicure colour for the false nail. Then you apply the balls using the funnel to the wet nail. The funnel is for easy application with a resealable top. 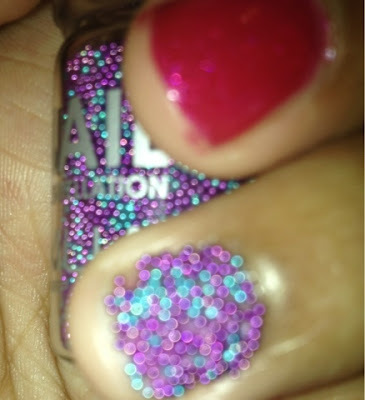 Do this to every nail then use the bowl to fill in the gaps, press the balls down to make sure they stick. Use a top coat to help keep them in place. I didn't Google it till after I tried them so I didn't know you should use a bowl and stick your fingers in to fill the gaps. I'll be honest I was stuck feeling stupid and disappointed till I watched the video. I stupidly picked up the bottle with no instruction booklet attached. I wouldn't use these on short nails unless you're good at applying things like these. What I will say is it didn't last very long even on the false nail. I moved it about an hour later and loads fell off like I hadn't already taken off the access. I'd say this look is perfect for going out clubbing or a photoshoot but I wouldn't wear them for everyday use. 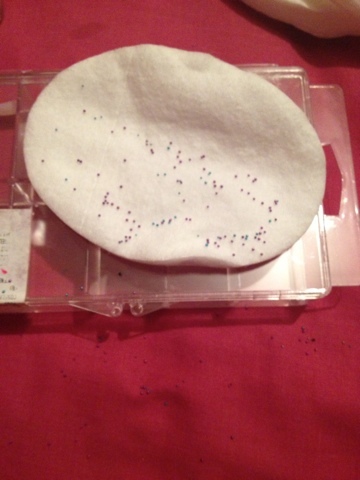 My bedroom floor is covered in little balls now which really annoy me when I am walking bare foot. This is the 'mess' I got using it without a bowl, it was pretty hard trying to get it back into the pot. If I lost this many each time I used it I'd lose over half a pot to nothingness. 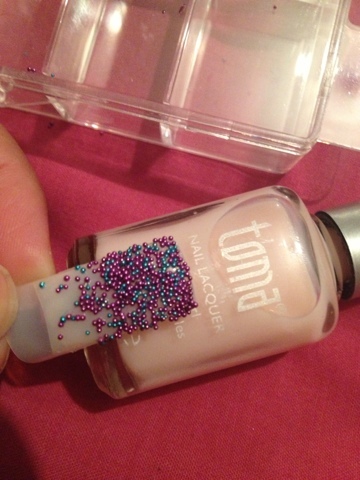 Has anyone tried MUA's Nail Constellations? How did you get on with them? I'd love to know if anyone has any tips on how to apply them. No I haven't tried... aft seeing this post I am fascinated.. Need to chk this out..